Does time fly during the second season of the Timeless TV show on NBC? 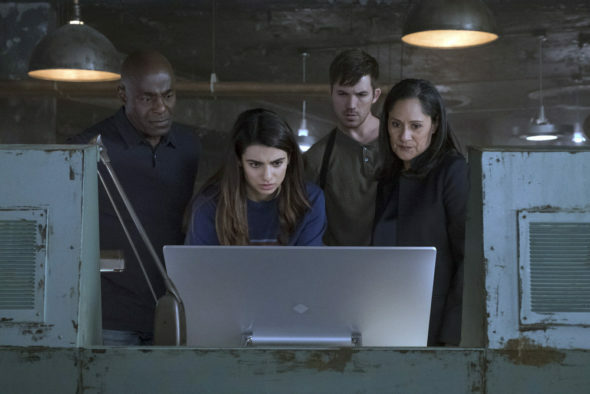 As we all know, the Nielsen ratings typically play a big role in determining whether a TV show like Timeless is cancelled or renewed for season three. Unfortunately, most of us do not live in Nielsen households. Because many viewers feel frustration when their viewing habits and opinions aren’t considered, we’d like to offer you the chance to rate all of the Timeless season two episodes. **Status updates below. An NBC time travel drama, Timeless stars Abigail Spencer, Matt Lanter, Malcolm Barrett, Goran Višnjić, Paterson Joseph, Sakina Jaffrey, and Claudia Doumit. Season two picks up right after the events of last season and follows Rufus (Barrett), Wyatt (Lanter), and Lucy (Spencer) on their quest to prevent the destruction of our world as we know it. This season they’ll find an unlikely ally in their mission to destroy Rittenhouse, a deadly organization Lucy’s family has been a part of, for centuries. As they try not to change the past, they will visit 1692, 1917, 1941, 1981 and more, and encounter Marie Curie, Hedy Lamarr, William Randolph Hearst, and other influential historical figures. What do you think? Which season two episodes of the Timeless TV series do you rate as wonderful, terrible, or somewhere between? Should NBC have cancelled or renewed Timeless for a third season? Don’t forget to vote, and share your thoughts, below. **7/31/2018 Status Update: NBC has ordered a two-part Timeless TV series finale movie. Details here. **6/22/2018 Status Update: Timeless has been cancelled by NBC. While there will be no season three, there is some hope for fans. Details here. More about: Timeless, Timeless: canceled or renewed? I loved this show. Watched the two hour finale last night and sobbed during the ending with the song TIME AFTER TIME! It was so well done. I’m buying the complete series dvd. Loved Timeless. Broke my heart that they cancelled.esrned so much history. Loves the pilot….let him live! Love Timeless and the characters. Great show. It seems that every time I like a show it gets cancelled. Anyhow i”m glad there will be a 2 hour show. I’m also broken hearted. I watch the episodes over and over. Love Timeless. Breaks my heart they cancelled. Please renew this show!!! One of my favorites!!!!!!! best show ever!!!! please renew!!!!!!!!!!!!!!!!!!!!!!!!!!!! !